Free Shipping Included! 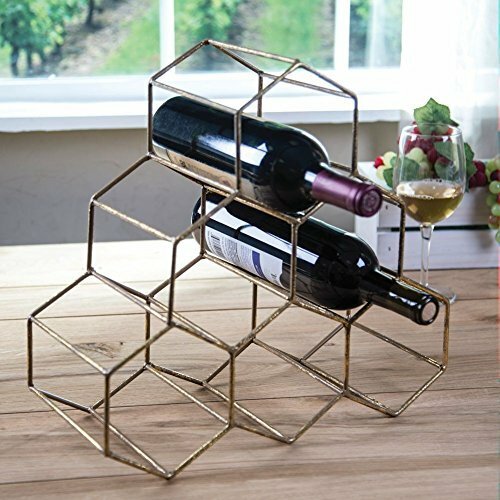 Metallic Hexagon Wine Bottle Holder Rack by HOME ESSENTIALS & BEYOND at Verve Wine Bar. MPN: 79135. Hurry! Limited time offer. Offer valid only while supplies last. 14-Hexagon Wine Rack holds 6-bottles of wine. For use as a tabletop wine rack or on the bar. Multiples can be used together to form a larger rack. 14-Hexagon Wine Rack holds 6-bottles of wine. For use as a tabletop wine rack or on the bar. Multiples can be used together to form a larger rack. Has a brushed gold finish. Modern and Geometric, your 6 bottle wine rack has a classic gold finish for an industrial meets glam look. Your wine rack is 15"x6"x14" and holds 6 bottles of wine.